Observation - Social Wasp - unknown - UK and Ireland. 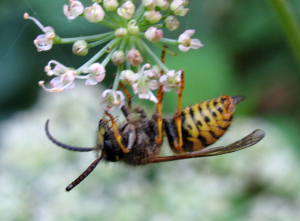 Description: Is it possible to id this wasp? Sorry the photos are somewhat out of focus. My best guess is D. norwegica. Is it possible to id this wasp? Sorry the photos are somewhat out of focus. My best guess is D. norwegica.